I managed to set my 2nd mail account as my new default mail account. So in Thunderbird, the previously 2nd account folder shows up on top now. But when sending an email, the default "From" address is still picked from the previous default mail account (default identity from account), and not from the new default mail account. I restarted Thunderbird, but the issue remains. Do I need to change the default account for the "From" as well? If so, how can I do that? Or is it a bug? If you set the Email Address and Reply-to Address fields correctly, these should appear as the From and Reply to in your sent e-mails. There isn't something as a general "default From: address". In each moment you have one of your accounts selected - e. g. by clicking to one of it sub-folders. 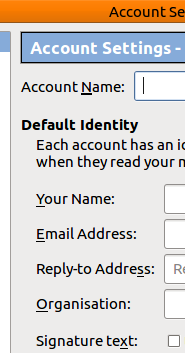 The "Default From: address" will be the actually selected account e-mail address. After restarting Windows, the problem was solved, and the default from address was chosen correctly from my new default mail account. Not the answer you're looking for? Browse other questions tagged email thunderbird or ask your own question. Thunderbird: How to reply with same E-Mail (when multiple identities)? How Do I Show Unified Inbox Folder at Startup in ThunderBird?